The Oisans/Ecrins region around Les Deux Alpes has no shortage of ski touring terrain to offer. Whether with a guide, on a course or on your own, there are plenty of routes to tackle. This page should help you to find the best ski touring in Les Deux Alpes. 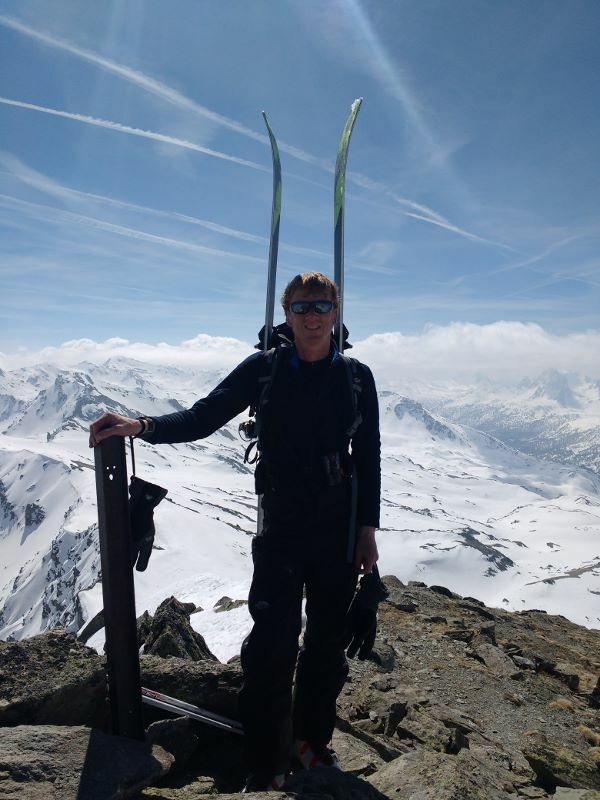 Scroll to the bottom of the page for an index of the local ski touring routes on this site. If you have transport, or book with somebody who does, there is a vast playground available to you. Without transport, most of the ski touring you can reach from the resort involves glacier travel and quite committing terrain. There are some fantastic single and multi-day adventures which start from the Glacier de la Selle. However, even with these, you will need to arrange transport back to Les Deux Alpes afterwards. A short drive to the north, rolling hills and high plateaus offer easy ski tours on less serious terrain, avoiding the dramatic rocky peaks that punctuate the landscape. The Chazelet, Galibier and Mont Thabor areas all give a good introduction to ski touring. These areas all offer some bigger excursions if you are looking for something more challenging. In the heart of the Ecrins Massif, there are great high-mountain ski tours like the Tour de la Meije. The possibilities for linking refuges and high glacier crossings are endless here. Places like La Grave and La Berarde are infused with mountaineering history, as are the high peaks that surround them. Unlike Chamonix or Zermatt, these places are rarely crowded. It is not unusual to find complete solitude in these mountains. 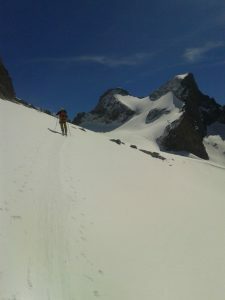 For ideas on ski touring in Les Deux Alpes, have a look at the list of Ecrins tours on this site. All of these are within easy driving distance of Deux Alpes and you can book myself or a colleague to ski most of them. For the high-mountain glacier routes, I can help you to organise a mountain guide. You can also look at other ski tours on the site, where I list routes I have done elsewhere. My favourite one day tours near here are the Col du Replat (descending to La Berarde) and the Petite Buffe from Chazelet. 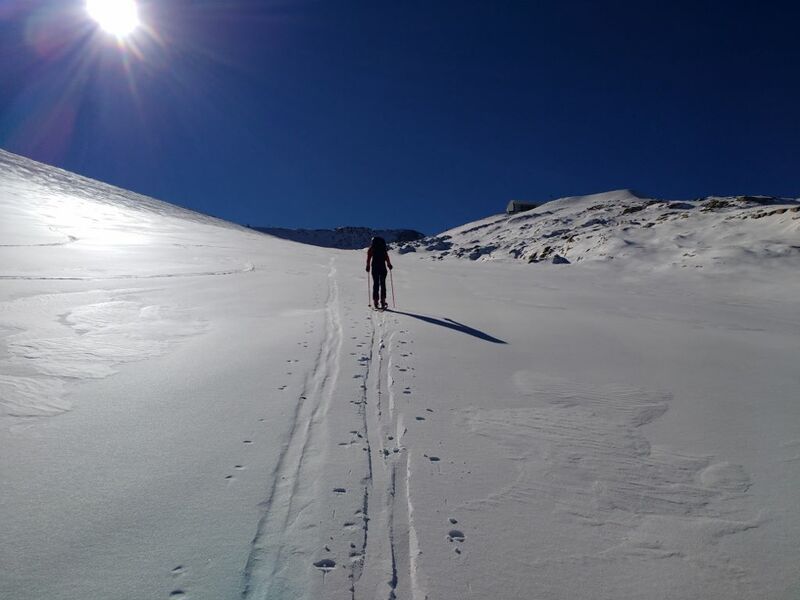 The best starting point for numerous ski tours of different aspect is the Col du Lautaret. It also has the advantage of road access up to 2000 metres which is kept open all winter. Olizane publish a fairly comprehensive series of ski touring guidebooks for the French Alps. Unfortunately, they are organised by department. Our position near the border of Isere and Hautes Alpes means that you need to buy two books to cover all the tours nearby. That said, they are very useful books, each containing hundreds of routes. Another useful series of books are the Volopress Editions Toponeige guidebooks. These focus more on ski-mountaineering than ski touring, so the routes tend to be steeper. As a result, there are many extreme routes and fewer for those starting out. The Ecrins North guide covers the area around Les Deux Alpes. It has the advantage of covering both sides of the Hautes Alpes/Isere border, unlike the Olizane books. Like any alpine ski resort there are plenty of ski hire shops lining the streets of Les Deux Alpes. Ski touring equipment is a bit more specialist and only a few shops will rent it. Those that do include Ski Extreme and La Skirie, both on Avenue de la Muzelle. In the Village 1800 part of the resort, the Sport 2000 FL Sport shop has a good selection of Dynafit gear.